im in the same boat, and leaning heavily toward the AR10, as I don't have the capacity to reload yet either. that being said, i try not to consider these matters an "either or" as i will likely get into both down the road one way or another, so the question is, which first? Get a PSA AR10 on sale for about $800, good optic for another $500, the rest in ammo and mags. Just get a .300 Blk upper, more mags, and a reloading setup/components. Or if he's willing to use the optic he has for now until he can scrape together some more cash later, use the $1800 to get a PSA PA-10, PSA 300BLK upper, mags, and ammo. There's plenty of better stuff on the market, but his budget would allow him to get both if he went the PSA route. I did this. I highly recommend it. Completely different beasts, really. The 300 will give you a little better terminal performance and extend realistic hunting ranges by maybe 50-75m. The .308 is certainly a whole new deal, though. Also, I would look very closely at the DPMS Gen2 models. The only downside to them is the now proprietary parts, in which case Id still recommend their Gen1 models with no qualMs. But to be honest, I would first buy some reloading equipment heh. I have a blackout and a .308 RRA. I like the blackout when shooting subsonics suppressed and the .308 is for longer distances and hunting. I would suggest get a .308 the only makers I have experience with is RRA and Larue, but I have heard good things about Smith & Wesson. 300bo effective range on game at 800 FPE is about 200 yards and the 308 is roughly 750 yards. What are you using it for ? If you are not going to shoot subs the 300 bo doesnt make sense to me but some people like it for supersonic. In AR15 in hunting calibers there is also the 277 wolverine, 6.5 patriot or whatever its called, 6x45, 6.8 spc, 6.5g +++ many others. I did a 35 gremlin AR15 last year. In AR10 there are a lot of calibers also from 243, 308, 338 fed, 358 win 8mm wsm. Just depends on what you are doing. If just plinking and dont reload I would buy something with the cheapest ammo. i dont get the whole 300 BO fad. a 30 cal bullet in a 556 case. awesome. why not just shoot a 308 in a 762 case like normal? my 308 is very light and just as easy to move around as my 16 556 ar's. This times 10. I had a 300 blackout and it was the worst investment I've made in a very long time. It's a neutered 308, and that's all it will ever be. I'm not kicking in doors and needing to silently kill a guy with the switch of a mag. Go for the 308 and if it does come up in the future you can hand load for supressor or cheaper shooting in general. It is not a neutered 308, it is more versatile than one. They are different cartridges that both have expounded qualities expressed all over this forum. Several deer have died from my neutered 308. 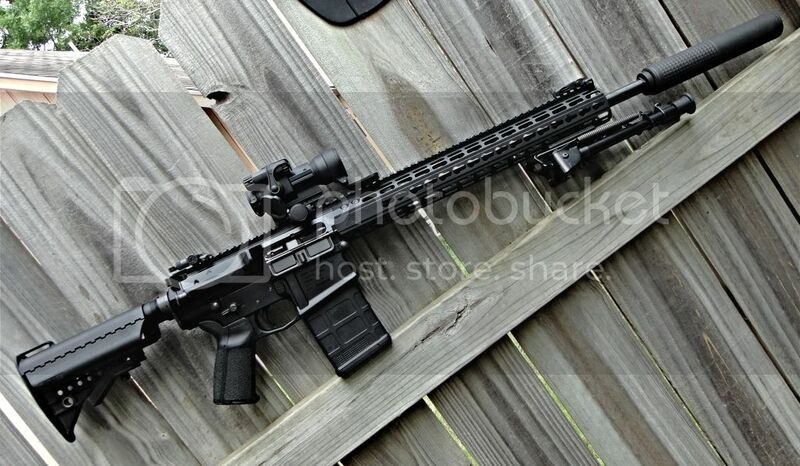 That being said you could buy a 277 wolverine , 6.5 , 6.8 , 300 blackout 450 bushmaster, 458 socom or a 50 beowulif upper and use your existing lower all have their plus and minus or if the 308 bug has bit I would look hard at the dpms gen2 light weight hunter. the 300 black is so much lighter of a recoil its weird to even compare them in the same sentence. The more inclined you are towards a short barrel, supressor and sub-sonic ammo, go 300 Blackout. For precision shooting and mid-range hunting and beyond, go .308. I like my 300 and it's fun to shoot, but it has its limitations. 300 ammo is getting easier to find. It may be getting easier to find, however unless you reload yourself, it's still all expensive. Minimum price is around .75 per round. Highest I've seen is over 2.00 per round. Versus a 308 even most match ammo is still cheaper than the 300BO. As far as not being a neutered 308, that's false. It uses the same caliber projectile, just a smaller case. So yes, it is a neutered 308. Yes recoil is almost non-existent. If you are teaching someone to shoot an AR platform rifle for the first time, this is a great round to use, but again will be very expensive quickly, unless you reload. You are limited on taking game to 300yards or less for humane kills. I do t know why this round was made, but in my opinion it's a neutered 308. Sorry if I have different views than some of you. 300Blk upper and a 308 bolt gun. Unless you are going to shoot subsonics and suppres I would go with the 308. Nothing against bolt guns, still have one. However, I sold my Savage .308 after obtaining an AR10 .308. Now I have a 20" AR10 and a 16" AR10. The Savage was a tool. The AR10 functions as a tool and a fun machine. For the amount of money you want to spend, I say get that 300 BO upper AND the AAC 762-SDN-6. That way you can use the can for both your 5.56 and your 300 BO. I would go .308 because a box of .300 BO is $27.99-31.99 usually....308 ammo is much cheaper, $14.99 to $19.99...I built my .308 tac carbine for about $1750. I'm waiting for my scope to get back from being coated in Multicam. If your going to reload the .308 is still cheaper. Don't waste ur money on PSA. get the aero precision m5-308 upper and lower. That's what I got and it's completely compatible with the necessary AR15 parts. Uses a high profile Handguard and I have the CMMG rkm Handguard. You can also buy the CMMG Mk3 rifles in your price range, but I love to build mine. I'd recommend getting a suppressor and a reloading setup first, unless there is a specific need for the different caliber. Doc, you do know the ".308" aka 7.62x51 is a "neutered" 30-06 right, developed by gov to replace 30-06 after ww2. Have to say as well 300 blk has been one of my best investments, as I enjoy shooting it. Dont get me worng I like to take .308 out past 750yrds every now and then but how often is that for me. If you don't plan on running suppressed then skip the 300blkout and go with the 308. 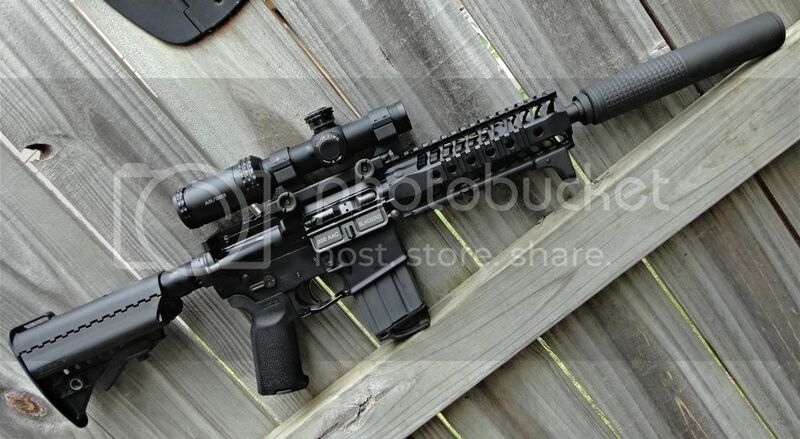 I built one using a Aero M5E1 with modular handguard from cschuyler (Schuyler Arms site vendor here). 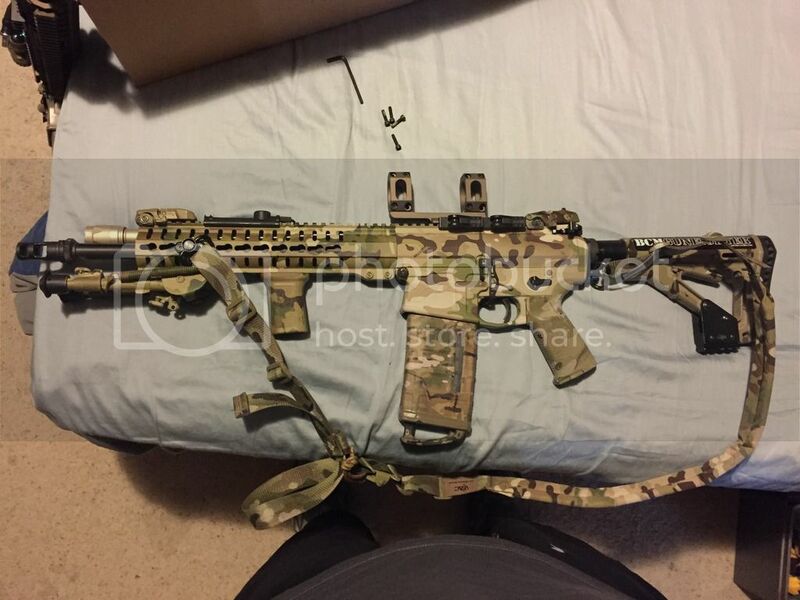 Used a Nitride BCG from AIM, barrel from hochimen (vendor on here, he had some Daytona barrels), G2S from Atlantic, and PSA PA-10 stock kit (changed out the stock). It shoots great and I have been able to pick up 308 for $10-12 a box so I have been stocking up on it. Running a Extra Aimpoint on it for now until I can get some decent glass for it. Really depends on your intended use for the rifle. Not being a 300 book fan boy, and you saying you don't wish to suppress the weapon, .308Win all the way! Personally I would say 18" barrel or even 20 to reduce muzzle blast. Anything longer than 18" is doing nothing for muzzle velocity, but it will reduce blast. As for brand, build your own...Mega Arms is the way I'm going when I start my next build. All this said, IF you wanted a suppressed pistol, I would have said 300 blk all the way. Lol. Apparently the 300 blk hate still exists. Funny how the 277 wolvirine or the 6.8 are never referred as neutered 270 Winchester, or the 6.5 as a neutered 6.5 creedmore, or the 7.62x39 as a neutered 7.62x54. Or the 458 socom as a neutered 458 Winchester. And 800fpe requirements for hunting is a myth. OP what is your ultimate use for this build? PSA is gtg, and they also have .300blk ammo for way cheaper than $28/box. I picked up a 50rd. brick of fiocci for $28.....that's cheaper than your boxes of 308. I also have a 300blkout that I use suppressed with subs and also shoot supers. My brother and I are on a trust so I use his while I wait for my can to get out of jail. I plan to use the 300blkout for HD and the occational hunt when I get a chance to. If it was me, and if you plan on shooting its whole life under 200 yrds, or ever going supressed, or reloading, then 300 blk no question. Factory Ammo cost is pretty close. Reloading cost is close too. (Pills are more expensive for 300 blk subs 175gr-220gr, but only 9 gr. of powder vs 40+ gr. for .308) But how much does that .308 cheap ammo cost if you have to buy a $1000+ gun just to shoot it. Verses a $300-$500 upper. Just some things to think about... Again both are great calibers. But each has its role. Disregard this post, as I do not have any experience with .308 ... I intend to eventually own a .308 bolt but as flat as it is in my area I don't have many long range opportunities. So I am in no hurry. Wife holding you back from going to the range? No worries. Reloading can be more fun than actually shooting! You get to play with gun related stuff in the comfort of your own home (especially during winter). If you are reading forums on this site you will begin reloading eventually. Why not start now! Like everyone else on this site with the fever you will ultimately own both so pick one and enjoy it until you've hid enough cash from your wife for the next. Go with .308. I have both and they both rock, but if you don't reload the .308 makes more sense.